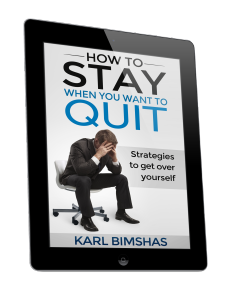 This book is for those who find themselves in the disheartening position of no longer loving their job or current situation and wanting to quit, but feeling trapped. There are no quick fixes in this short story, but there are plenty of ideas presented that you can apply right away. There are a few changes from the first edition, which was published in 2008. It’s still a story about one friend helping another transfer from a whiner to a winner. But to give you a jumpstart on thinking differently, one of the friends is now, you. It may not be you exactly, but I think you’ll find similar, immediately identifiable traits. Being miserable and disengaged serves no one, least of all you, so take action. Read along to uncover how Madeline shares what she has learned to help you stay when you want to quit, and develop strategies to get over yourself. Interested in working with Karl Bimshas?